Although a well-maintained water heater can last a long time, eventually every water heater needs to be replaced. When you need a plumbing and heating company you can trust with a new installation, come to the capable technicians at Reliable Plumbing & Heating. We serve the Monterey Peninsula as well as Salinas, San Juan Bautista, Hollister, Watsonville, Santa Cruz and the surrounding areas. We’ll handle your installation with professional care, friendly customer service, and dependability that will last for years to come. If you want a water heater installation that comes with custom solutions, use of modern technology, and a two-year warranty, Reliable Plumbing & Heating Services is your company. Our extensive knowledge of the field brings you the best in water heater installations to replace your old heater with a more energy-efficient model. During your installation, our technicians will give you tips on how to make your water heater last through the years, how to tell if your heater needs to be serviced, and why you should keep up with a regular routine maintenance. We’ll get the job done on your schedule so you won’t be inconvenienced or made to wait longer than necessary. Your search is over for the best water heater installation company in Monterey. 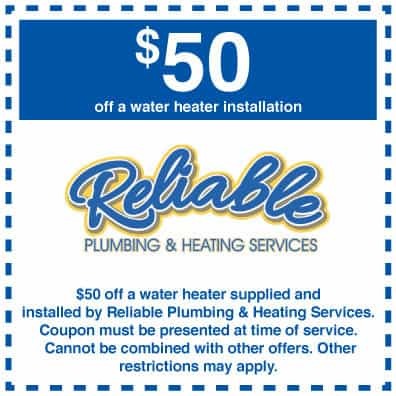 Call Reliable Plumbing & Heating Services at (831) 394-7077 to set up your appointment, or contact us online.